As part of NASCAR Salutes Refreshed by Coca-Cola, the industry’s collective expression of respect and gratitude for those who bravely serve our country, Gateway Motorsports Park, NASCAR and Camping World will salute Scott Air Force Base’s 100th anniversary during the NASCAR Camping World Truck Series Drivin’ for Linemen 200 on Saturday, June 17 (8:30 p.m. ET on FS1, MRN and SiriusXM NASCAR Radio). Gateway Motorsports Park will host service men and women stationed at Scott Air Force Base to take part in the day’s festivities. The first 10,000 fans through the spectator gates will receive American flags for a special recognition of our service members prior to the race. Additionally, each driver entered in the race will carry a Scott Air Force Base decal to celebrate the base’s 100th anniversary. United States Air Force personnel will ride along with the NASCAR stars during driver introductions and more than 60 men and women from Scott Air Force Base will participate in the pre-race ceremonies, including the singing of the national anthem. Additional USAF personnel and their families will be GMP guests for the race. Scott AFB is located near Belleville, Illinois, 20 miles from the speedway. The base was completed in August 1917, just four months after the United States formally entered World War I. The 600-acre facility is named for Corporal Frank Scott, the first enlisted service member to lose his life in an aviation accident. Today Scott AFB continues to be the home of the 375th Air Mobility Wing, the 618th AOC (TACC), the 18th Air Force, Air Mobility Command, and the United States Transportation Command. 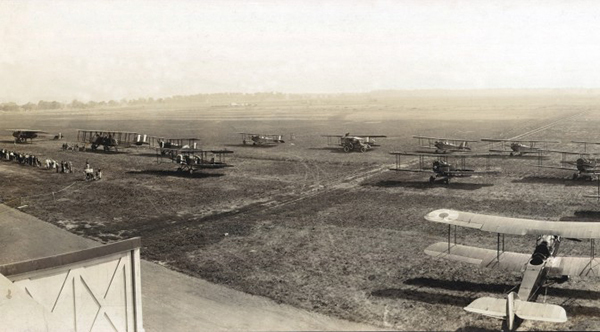 One hundred years after its construction, Scott AFB continues to play a crucial role in military operations and worldwide humanitarian efforts. Tickets for the June 17 NASCAR Camping World Truck Series Drivin’ for Linemen 200 are on sale and may be purchased at the GMP ticket office, by phone at (618) 215-8888 or online at www.gatewaymsp.com. General admission tickets start at just $36 and kids 15 and under are free (general admission). To learn more about NASCAR Salutes Refreshed by Coca-Cola, visit NASCAR.com/Salutes. 8:30 a.m. — Spectator parking lots open. 9 a.m. — Spectator gates open. 9 a.m. — Climbin’ for Linemen competition begins (infield). 9:30-10:25 a.m. — NASCAR Camping World Truck Series Drivin’ for Linemen 200 practice. 11:30 a.m.-12:25 p.m. — Final NASCAR Camping World Truck Series Drivin’ for Linemen 200 practice. 1:30-2:30 p.m. — Illinois Lottery 40 ARCA Midwest Tour practice and qualifying. 2-2:45 p.m. — NASCAR driver autograph session (infield). 2:30-4:30 p.m. — Free concert by The Band Steele on the midway. 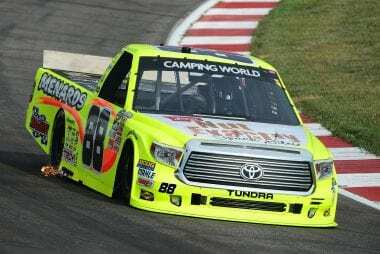 4:45 p.m. — NASCAR Camping World Truck Series Drivin’ for Linemen 200 qualifying. 5:45 p.m. — ARCA Midwest Tour Illinois Lottery 40 driver introductions. 6:10 p.m. — ARCA Midwest Tour Illinois Lottery 40 (40 laps, 50 miles, timed event). 7 p.m. — NASCAR Camping World Truck Series Drivin’ for Linemen 200 driver introductions. 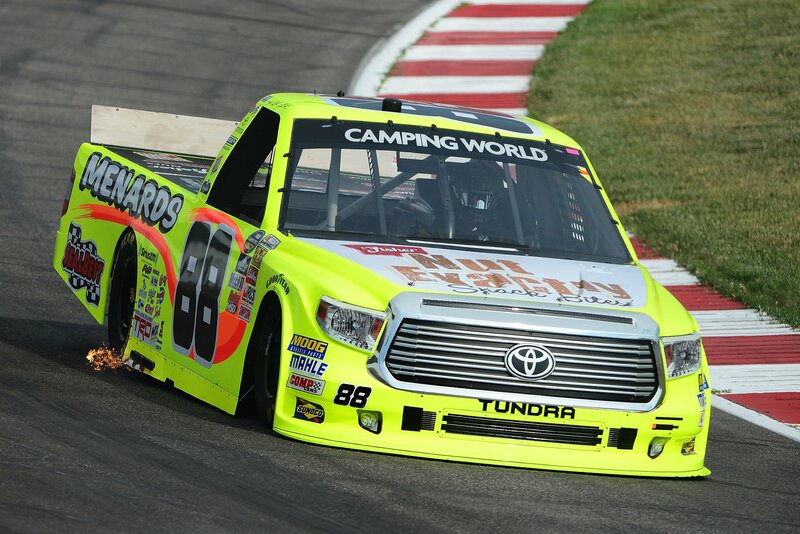 7:30 p.m. — NASCAR Camping World Truck Series Drivin’ for Linemen 200 (160 laps, 200 miles). Twitter hashtag: #D4LM200 and #NASCARSalutes. Follow GMP on Facebook, Twitter, Snapchat and Instagram.